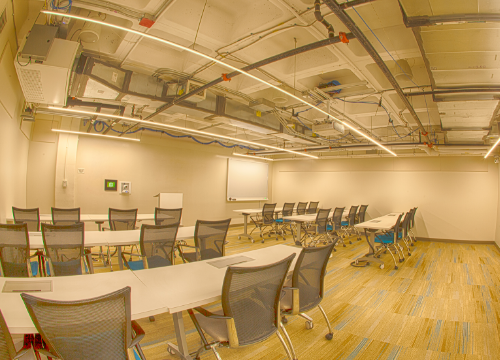 Room 219 is a standard conference room located on the second floor. With 16 mobile tables and 32 rolling chairs, this room can adapt to almost any meeting format necessary but works best in classroom style. With a full glass wall overlooking the Second Floor Concourse, your guests will appreciate the open feel of this room. 16 Table Inputs (VGA, HDMI, 1/8’ Audio): Users will be able to present from their laptop to the projector and screen. Smart Kapp: Digital Whiteboard with Bluetooth and NFC- Users will be able to connect their mobile devices to the board to share content that is drawn on the whiteboard with remote users and save to their device. Our Center Animator will be available to assist you with any technology needs you may have before and during your event. This service comes included in your reservation fee.